Sharpy wrote: Planted the coldframe today...temps have ranged from 32Ã‚Âº to 98Ã‚Âº, but I will start propping the lid open a bit now during the day. Planted Tomatos x 3, red cabbage, cauliflower, broccoli, and 3 kinds of peppers. Hope it all works out but plenty more plants in basement just in case...wish me luck!! Is there anything you can do to help keep the heat in during the night? Maybe add some hey/straw or mulch? AndrewH_TX wrote: Is there anything you can do to help keep the heat in during the night? I believe you are talking CCA Chromated copper arsenate not creosote. We can still get creosote railroad ties. I would not use either in a food situation. The new treat lumber, like Sun Wood maybe safer, I'm not taking a chance. The treated landscape timbers sold today are safe to use. The $1.97 price is a good price. It is Home Depots "on sale" price. Next week, they will probably be $3.97 each. Don't plan on buying some and letting them sit around. When the retail stores receive them, they are usually still wet from the pressure treatment. They band the bundles with strong steel banding to keep them straight. When they cut the bands, they start warping. If you take them home from the store and don't use them quickly, the will probably warp so much you can't use them. Needed? Well not necessarily, but the more "heat" you can keep built up the better it'll be for the plants. 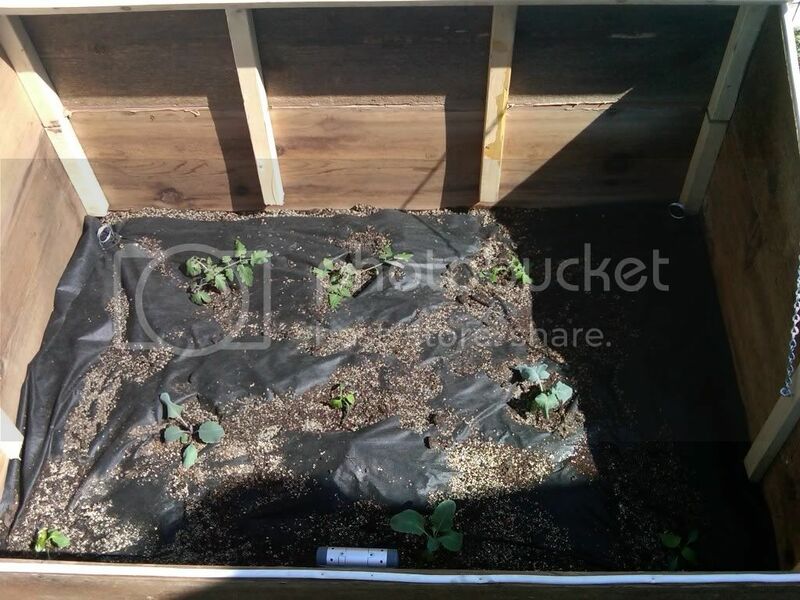 I believe it's more important to keep the roots warm, but you have to keep the tops from freezing since the water will expand and burst the cell walls (which I'm sure the coldframe is achieving). It is hard to give advice for a weather zone I'm not familiar with. Not sure if y'll are receiving cool enough temps still to justify the hay/straw/mulch. I normally add hay or mulch to help keep in moister anyway though, which it'll double as a heat barrier (to keep the heat in). Oops, that's right CCA. I believe the EPA is trying to ban creosote RR cross ties and telephone poles. So their days are numbered. I know there are several cities that no longer allow creosote telephone/light poles. All of my beds have treated tiles around them. If a problem, too late, I am not going to change them over. They don't smell like the old creosote posts did, and yes, I am quite old enough to remember them. And to remember what creosote splinters did when you got those! Ouch! I do have one tile that is rotting out, the others have been there probably 8 years? The previous boards only survived for 2-3, and seemed to need constant replacement and splicing. I always assumed that all lumber would warp if it was left out in the weather and not firmly nailed into place. But, thanks for the reminder. I figured, if the treated lumber is an issue, oh well, if I don't use it, and don't have a garden, I will get alot more chemicals on store bought food, so I just went for it, way back when the beds were built. How about a binky, (blanket). On the colder nights cover it with a quilted blanket. Moving blanket. That's a great idea, I can fit that no problem, Thanks DoubleDogFarm!! Ozark Lady wrote: I always assumed that all lumber would warp if it was left out in the weather and not firmly nailed into place. But, thanks for the reminder. Your right OzarkLady! But it doesn't usually twist into a pretzel shape in a couple of days. It's not really that bad, but it is pretty bad. I've had to throw a few away simply because they were twisted so bad after a couple of days. I went back to Home Depot and asked the manager why their timbers twist so bad now when they didn't used to do it. He said people should just expect them to twist if they don't use them quickly. He also said customers are welcome to bring them back and they will replace them with straight timbers, but you need to be ready to use them when you get them. I suspect they have that $1.97 sale when enough customers have returned timbers and they want to get rid of them. I always have to pick through the pile to find some I can use.